Serving Rock and Walworth Counties since 1965! Call (608) 313-1206 for more information. PREP empowers youth 11-19 years of age to make successful transition into adulthood by reducing their risk of having an unintended pregnancy and or contracting a sexually transmitted infection (STI) or HIV/AIDS. 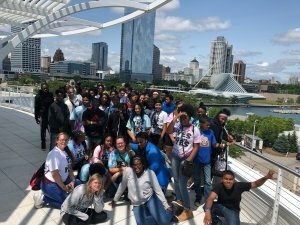 The program also addresses building healthy relationships, education about reproductive healthcare, understanding financial literacy, and increasing self-efficacy. PREP meets in a variety of locations including schools, group homes, social development clubs, churches, community learning centers and other community-based organizations. PREP requires 18-30 hours of interaction with youth. Participants receive a Certificate of Completion of evidence-based curriculum and are eligible to receive incentives including field trips based on participation and attendance. PREP is offered all year-round and is a FREE program. PREP actively recruits youth from the Beloit area to participate in the summer daytime camps. The Beloit public school schedule coincides with the dates of the camps each year. Daytime camps are available to youth 11-19 years of age. Meals are provided and many incentives including field trips are also provided. If interested please contact PREP staff at (608) 313-1206 to sign up. Make a donation now with our secure online donation form.